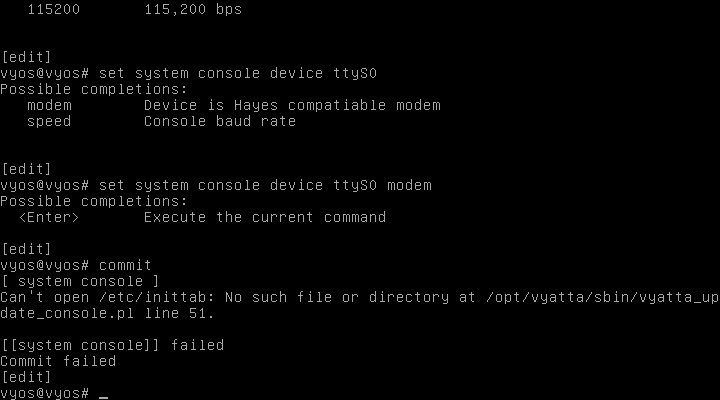 Tried to make my current production config work with vyos 2.0 code. The only remaining thing is serial console. Looks like existing code doesn't work with systemd. Add the code, looking on vyos version and making decision on what to patch, depending on it. I think, I can fix this problem myself, but I need advice in this decision and someone to test the result. For the jessie branch, we are likely staying with systemd, so systemd-related code will have to be added anyway. Whether to remove the inittab-related code or not, not sure. I don't think we should implement both right away, but if we leave some room for extending it to support other init systems, it should be fine I think. If you make a patch for it, it will be appreciated. Alter systemd configuration to use fixed speed from config. Modify speed to accept list of possible speeds, e.g. syncer assigned this task to mickvav. for now it is set to fixed speed. please close if agreed on this.